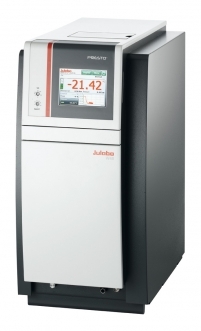 An entirely new generation of highly dynamic temperature control systems by JULABO. The new PRESTO® systems are designed for precise temperature control as well as rapid temperature changes, making them ideal for reactor vessels, material stress tests, or temperature simulations. These instruments cover a working temperature of -92 to +250 °C with high cooling and heating capacity. Highly efficient components give these instruments the ability to compensate for exothermic and endothermic reactions with extraordinary speed. Permanent internal monitoring and self-lubricating pumps contribute to the new PRESTO®’s long service life. The integrated 5.7-inch color industrial-grade touch panel is one of the identifying characteristics of the new PRESTO®. It gives the user a clear and well-organized view of important information while greatly improving user-friendliness. Once in operation, the new PRESTO® units are whisper quiet and barely audible in a laboratory. The new PRESTO® units are extremely robust and work reliably even if the ambient temperature climbs as high as +40 °C. Multiple interfaces permit remote control of the PRESTO® across networks and in superordinated control systems. Closed side panels without ventilation slits reduces to a minimum the amount of space needed to operate.